The 531-unitHundred Palms Residencesis the second EC to hit the market this year. It follows the 497-unitiNz Residencein Choa Chu Kang, which attracted more than 450 e-applications the weekend that it opened in February. By last month, the developer had sold 249 units, according to Urban Redevelopment Authority records. Both ECs offer residents "smart home" technology, with doors and electronics that can be controlled by an app. The indicative price for three-bedroom flats in Hundred Palms Residences, which is developed by Hoi Hup Realty, ranges from $715,000 to $975,000. Four-bedders could go for $1.03 million to $1.13 million, and five-bedroom units from $1.19 million to $1.29 million. More than 5,700 new private homes were sold from January to May this year, against the roughly 3,300 for the same period last year. Mr Desmond Sim, head of research for Singapore and South-east Asia at real estate firm CBRE, said a strong advantage for Hundred Palms Residences will be its location, in the "well-established vicinity" of Hougang and Serangoon North. "The biggest selling point is (proximity to) Rosyth School," he said. He added that there is still strong demand for ECs. "Despite no new launches, they have managed to sell in the region of 700 units. It was positive in the sense that (buyers) were picking up previous launches. There is still momentum." Developers sold 1,394 private homes last month, of which 370 were EC apartments. 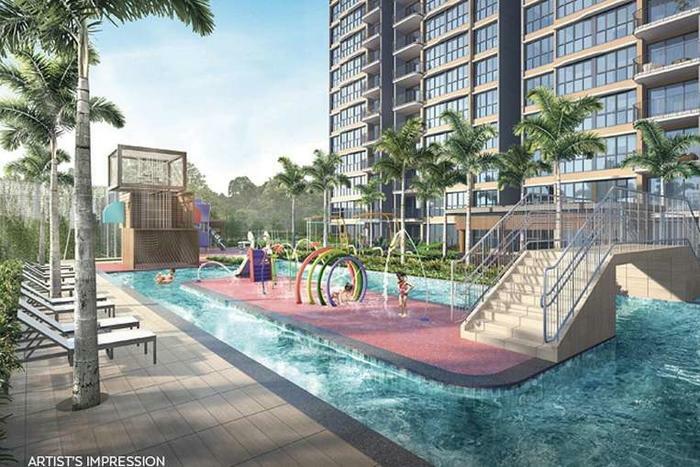 The top-selling project in May, Sol Acres in Choa Chu Kang Grove, was also an EC, noted Colliers International director and head of research Tricia Song. ECs on the market have only about 15 per cent of their stock left unsold, she said. "The last (upcoming project), in Anchorvale Lane, could launch in February next year, at the earliest." Ms Song said that for Hundred Palms Residences, "with no recent launches in the vicinity and it being near a good school, (the launch) should be interesting".